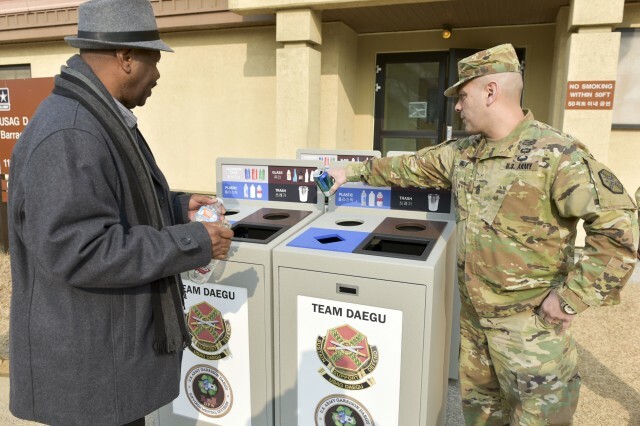 United States Army Garrison Daegu Directorate of Public Works, Environmental Office handed out recycling bins to USAG Daegu Camp Henry Consolidated Barracks, January 19. "The work that we do in the Environmental is ensuring that we all follow all federal state and local regulations to ensure the protection of the environmental resources," said Russell Grossley, Environmental Division Chief in DPW, USAG Daegu. "We perform inspections to ensure we are following those rules and regulations, ensuring that the units and shops have right tools and equipment to perform their duties in protecting the environment," said Grossley. The Environmental Office handed out recycling bins to the consolidated barracks, where there were none to help Soldiers recycle easier. 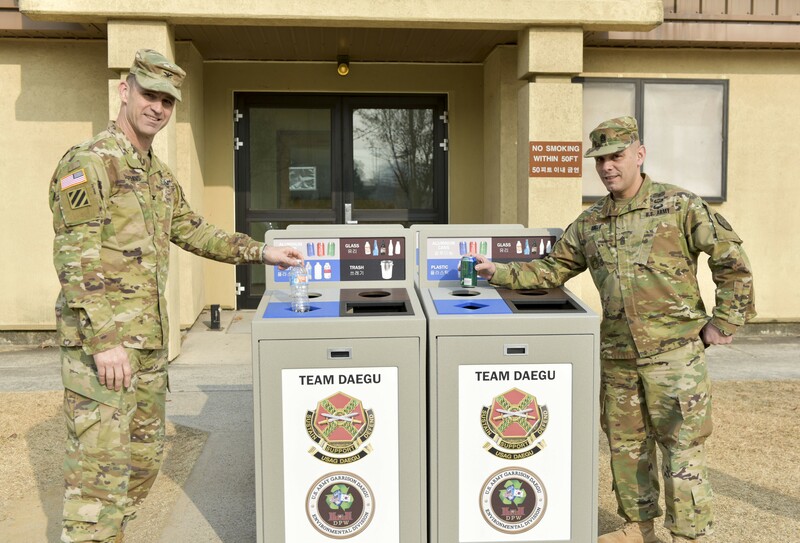 USAG Daegu Commander Col. Ted Stephens and CSM Juan A. Abreu took time out of their busy day to observe the installation of the Recycling bins into the barracks. Abreu added by saying, "There are three reasons recycling is important. It reduces waste. It reduces pollution, and it reduces the amount of energy it takes to reproduce items." "Right now, there are about 110 to 120 new recycling bins distributed throughout the Garrison," said Grossley. "The new ones are sturdier, can be placed outside, and also have 'dual language', both English and Korean on the bin. So everyone can understand what particular materials go where. 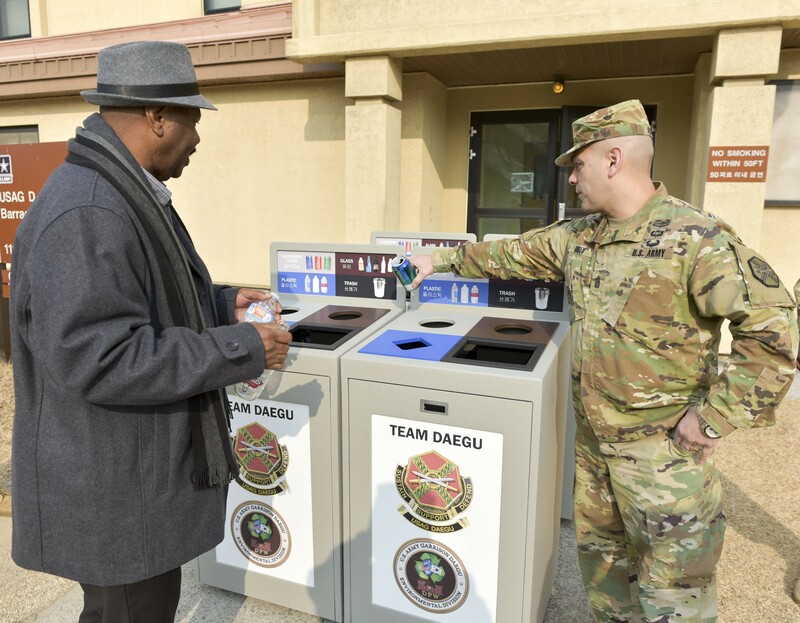 "It is important to recycle in the barracks as any other facility, because we generate waste," said Abreu. "It is also important to make sure that all are held responsible for the environment and take care of it." According to Grossley, approximately about 8,600 tons of solid waste are generated in Area IV. "Of that 8,600 tons, we recycle approximately 67%. Our cost avoidance by recycling is approximately $385,000 a year. Recycling is the right thing to do. It helps us to conserve natural resources, protects our cultural resources and protects the overall environment," said Grossley. "It is important to recycle because it is the right thing to do, as well as practicing good environmental stewardship," said Pfc. Teion Middleton, USAG Daegu command group administrative. "I want to tell the USAG Daegu, Area IV. Take pride in your environment, in your community. Make a difference," said Abreu. As he is saying, Area IV is certainly making a difference, conserving energy and recycling.